Last night's Ashes, Paper & Beans episode, 21 July 2009, started with a live interview with Sleepy Driver band member John Heinstein to talk about their new CD Steady Now and its launch party 8 pm, Thursday, 23 July 2009, at the James Joyce Pub in the Crowne Plaza Lord Beaverbrook Hotel, on Queen Street, Fredericton, NB. Interview included three cuts from the CD "Like a Weapon", "When the Lights Come On", and "Architects". Show continued with "It's Over" by Sheri-D Wilson with Russell Broom; a piece from Side by Side Festival 2004 by Jo-Anne Elder and Herménégilde Chiasson; poet Ami MacKay; fiction from Madeline Kim; poems by Peterborough's Betsy Struthers and ending with "What Are Bones For?" by Montreal's Fluffy Pagan Echoes. 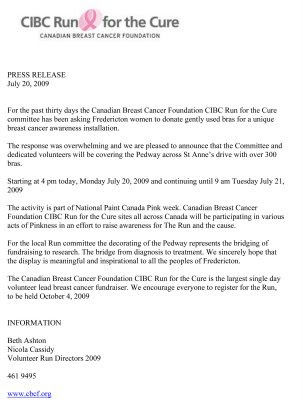 After UNB class today I biked downhill to the riverside Green expecting to see the completed installation of bras across the pedway but they'd only just started selecting the banners; so I spent the next hour or so helping hang the banners and lengths of clothesline holding over 300 donated bras from the Fredericton community [and I was given one of the pastel pink T-shirts to wear]. A happy Beth Ashton, Volunteer Run Codirector 2009, with the literature. A Pedway of Bras with several volunteers waving at the rush hour traffic on Pointe Sainte-Anne Drive. Beth and (I think?) Louis beside the road with a sign and giant hand. Tomorrow morning the bras all come down. Sheri-D Wilson + Russell Broom: "Where Was I?"